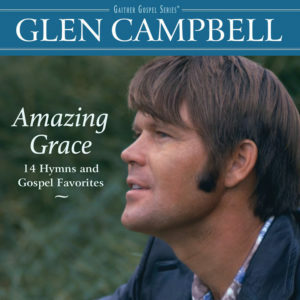 Gaither Music Group is pleased to pay tribute to the music and legacy of music icon Glen Campbell with the upcoming release of Amazing Grace, 14 Hymns and Gospel Favorites. The newly-compiled CD collection of gospel music favorites, scheduled to release on February 23rd, captures the heartwarming voice of this beloved musician, singer, movie star and television personality. That conviction can be heard on Amazing Grace, 14 Hymns and Gospel Favorites, which features household favorites such as “Love Lifted Me,” “The Old Rugged Cross,” “Blessed Assurance,” “Mary, Did You Know?,” “What a Friend We Have in Jesus,” “Just a Closer Walk with Thee,” the title song and more. In a legendary career that spanned more than six decades and garnered over 80 hits and more than 50 million records sold, six-time GRAMMY® Award-winning Campbell created an indelible mark on American pop culture. Country music’s first crossover star, Campbell achieved global chart-topping success through the pop, country and gospel music genres. From his time as a groundbreaking guitarist for Elvis Presley, Frank Sinatra, The Beach Boys and many others in the archetypical backing band The Wrecking Crew to his decades atop the charts, few artists have touched as many lives as the Rhinestone Cowboy, who was awarded the GRAMMY® Lifetime Achievement Award in 2012. The Amazing Grace, 14 Hymns and Gospel Favorites CD will air as part of a special television offer on DISH TV, DirecTV, AT&T U-verse, RFD-TV, GaitherTV, PBS, TBN, FamilyNet, CTN, GMC, GMTN, Guardian, Liberty, TCT and TLN. It will air in Canada on Vision TV, CTS, The Miracle Channel and Hope TV. Amazing Grace, 14 Hymns and Gospel Favorites will be featured on Sirius XM’s enLighten Channel and will be promoted via the Gaither consumer catalog, the Gaither Music Group web site as well as label and artist social media campaigns. The collection is exclusively distributed by Capitol Christian Distribution and Universal Music and will be available at Walmart and throughout general market stores and the Christian marketplace in addition to online retailers including iTunes, Amazon and www.gaither.com. It is currently available for pre-sale at Christianbook.com and Amazon.com. This entry was posted in Christian Contemporary, Reviews and tagged Amazing Grace, Gaither Music Group, Glen Campbell by Kris Patrick. Bookmark the permalink.